Joe DiMaggio and Ted Williams co-owned the 1941 baseball season. 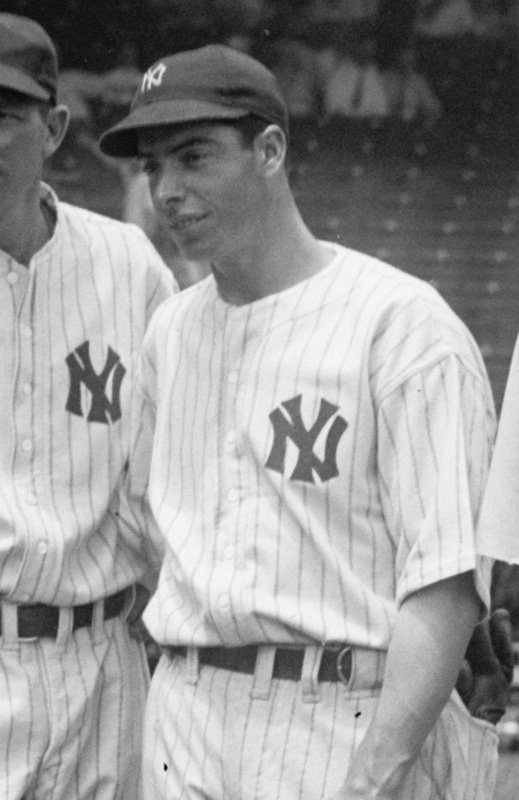 DiMaggio, the regal center-fielder for the New York Yankees, hit in 56 straight games in ’41, from May 15 through July 16. Since then, only the Cincinnati Reds’ Pete Rose has gotten within two weeks of that run to immortality, a 44-game dash in 1978. The Yankee Clipper batted .357 in 1941 with a .440 on-base percentage, 30 home runs and 125 RBI. He led the Yankees to 101 wins, the American League pennant and, in the end, a World Series title following a five-game series against the Brooklyn Dodgers. A few hours up the Atlantic coast, Williams put together an incredible year for the Boston Red Sox. The high-strung left-fielder, dedicated since his San Diego childhood to making himself, in his own words, “the greatest hitter who ever lived,” crushed A.L. pitching, good and bad. He ended the season at .406, the last man to reach that lofty, almost heavenly, .400 mark. The lanky Teddy Ballgame, just 23 years old and in only his third Major League season, belted 37 home runs to lead the league and drove in 120, fourth best. He topped everyone else, even the great DiMaggio, in on-base percentage (.553), slugging percentage (.735), runs scored (135) and walks (147). The Red Sox, though, still an also-ran and not yet the hipster unit of more recent times, finished in second place, a respectable 84-70 but 17 games behind the mighty “Yankees of New York,” as the great fisherman Santiago called them in The Old Man and the Sea. Not surprisingly, especially for that time, the baseball writers voted DiMaggio the American League MVP. Williams, who settled for second place in the standings, also settled for second place in the race for baseball’s top award. On this particular date in 1941, though, Teddy Ballgame got the best of everyone. He grabbed the headlines and the glory. And DiMaggio went 1-4. On this day, Joe and Ted weren’t even rivals; they were teammates. Briggs Stadium in Detroit hosted the All-Star game that year on July 8. More than 54,000 fans packed the park on a sunny day in the Motor City. Whit Wyatt, enjoying a big year with the Dodgers, started for the National League. Future Hall of Famer Bob Feller, ace of the Cleveland Indians, started for the American League. Back then, the All-Star game was a big deal. Oh, sure, now it—what?—”means” something, or something like that. The outcomes decides which league gets the home-field advantage in the World Series. Everyone hates this idea. But, back in the day, the All-Star game really did mean something. The players played for pride. Which was the superior league? A.L. or N.L.? As Leigh Montville writes in his biography of Ted Williams, the Mid-Summer Classic was the second-biggest deal in baseball, right behind the World Series. Williams hit fourth in the starting line-up for the American League, right behind DiMaggio. They both played the whole game. Because this one meant something. Pete Reiser, Arky Vaughn and Terry Moore went the whole way for the National League. The A.L. broke out on top 1-0 in the fourth inning on Williams’ double. The National League held a 5-3 advantage going into the bottom of the ninth. Williams came to bat with two out, two men on base and one run in. On the mound was Claude Passeau, a right-hander with the Chicago Cubs. The count at two balls and one strike, Passeau came in with a slider. Williams swung, a home-run swing, as he recalled in his autobiography My Turn at Bat. The ball sailed into right field, but Williams thought at first that he had missed the pitch. He figured it would go for a lazy fly out. It kept going and going and going, though, and Williams began leaping and smiling. Williams and DiMaggio co-owned the 1941 season. Williams owned the 1941 All-Star game. Joe DiMaggio hit safely in 72 of 73 games for the Yankees during one memorable stretch in 1941. Joe DiMaggio knocked a run-scoring single on May, 15, 1941, against Chicago White Sox pitcher Eddie Smith. The next day, the New York Yankees centerfielder belted a home run and a triple. No one thought much about the three hits in two games, except maybe some Yankee fans who were undoubtedly happy that Joe D might finally be breaking out of his long slump. The great DiMaggio had hit just .194 in his previous 20 games. The fans could rest easy. Their hero recorded at least one hit in 56 straight games, finally going hitless July 17 against the Cleveland Indians. Afterward, in the visitors’ clubhouse of Cleveland’s Municipal Stadium, DiMaggio shrugged off his first 0-for day in more than two months. He even posed for a picture with his thumb and index finger stuck together—zero hits. About the only one disappointed was ketchup giant Heinz 57, hoping the streak might last one more game. Most baseball fans think of DiMaggio’s 56-game hitting streak as one of the game’s greatest records and one nearly impossible to break. DiMaggio eclipsed the mark once held by “Wee” Willie Keeler, who hit safely in 44 straight games in 1897, when foul balls didn’t even count as strikes. The Yankee Clipper won the American League Most Valuable Player Award in 1941, in a year when the Boston Red Sox’ Ted Williams hit .406. And Williams was OK about finishing as runner-up. “Well, all right, but it took the Big Guy to beat me,” Teddy Ballgame said after the votes were in, according to Richard Ben Kramer’s 2000 biography Joe DiMaggio: A Hero’s Life. But, did the writers make the right choice? Should Williams have finished first and DiMaggio second and not the other way around? Certainly, both future Hall of Famers enjoyed seasons for the ages. Here is a comparison of both players in 1941. Going just by that set of stats, Williams had the edge. He led the A.L. in 10 important offensive categories. DiMaggio led in two, although he did finish second in several others. Now, it should be noted that stats like OPS and WAR did not exist in 1941. Joe beat out Ted in several “counting stats” that were important in pre-sabermetric baseball—hits, doubles, triples, RBI and total bases. Hirsch points out that Williams actually hit for a higher batting average (.412 to .408) during the streak than did DiMaggio and had a higher OPS (1.224 to 1.180). Hirsch, author of The Beauty of Short Hops: How Chance and Circumstance Confound the Moneyball Approach to Baseball, also wrote that DiMaggio was rather mediocre in many of his games during the streak. (In 23 of the 56 games, he was just 1-4 or 1-5). Beyond that, Hirsch pointed out that George Brett hit an unreal .480 for the Kansas City Royals over a 56-game period in 1980, the year he batted .390, and Rogers Hornsby hit .477 in a 56-game stretch for the St. Louis Cardinals in 1924, the year he finished at .424. Why don’t we read more about those great accomplishments? Of course, a record is a record, and DiMaggio did break one, a 44-year-old one at that. (George Sisler of the St. Louis Browns had set the modern-day mark with a 41-game streak in 1922.) Williams didn’t break a record; he simply did something no one had done since the New York Giants’ Bill Terry in 1930 (.401.) Williams’ mark is 17th on the all-time list, well behind Hugh Duffy’s remarkable .440 in 1894 for the Boston Bean Eaters (the forerunner of the Boston Braves and the current Atlanta Braves). The streak, though, was not the only thing that DiMaggio had going in his favor in 1941. It helped that the Yankees finished in first place with a 101-53 record, 17 games ahead of the second-place Red Sox. Another stat probably also helped out Joe D. After his 56-game hitting streak ended, DiMaggio went on a 16-game tear. He hit safely in 72 out of 73 games, also a record. Jason Stark, in a May 15, 2011 column titled Baseball’s Unbreakable Record, calls DiMaggio’s streak “the coolest, most romantic record in sports. … It’s the record that truly has it all.” And an MVP award to go with it. Boston great Ted Williams was elected to Baseball’s Hall of Fame on this date in 1966. Ted Williams set his goal about as high as a ballplayer might dare set one. He wanted to be the best hitter in the history of the game. He wrote that very thing on the first page of his 1969 autobiography My Turn at Bat. Williams, born Aug. 30, 1918, in San Diego, tried his best to make that happen. He headed to the North Park Playground just about every day as a boy. He’d get together with the other neighborhood kids and play Big League (groundball past the pitcher was a single, hit the ball above the bar and it was a double, etc.) We’d play Big League by the hour, Williams wrote. Then, Ted might take a break for some orange juice, freshly squeezed, and he’d play more Big League, until long after it was time to go home, begrudgingly. Home life was a mess for young Ted. His mom, May, worked as a soldier for the Salvation Army, mostly in Tijuana, Mexico. She was gone all day and some nights. Ted’s dad, Sam, ran a photo shop in downtown San Diego, taking pictures of Navy sailors and their gals. Young Ted Williams devoted his life to baseball. He starred at Herbert Hoover High School and for the San Diego Padres, then of the Pacific Coast League. Eddie Collins, general manager of the Boston Red Sox and a Hall of Famer, first saw Williams while on a scouting trip in southern California to watch another young player, Bobby Doerr of Los Angeles. 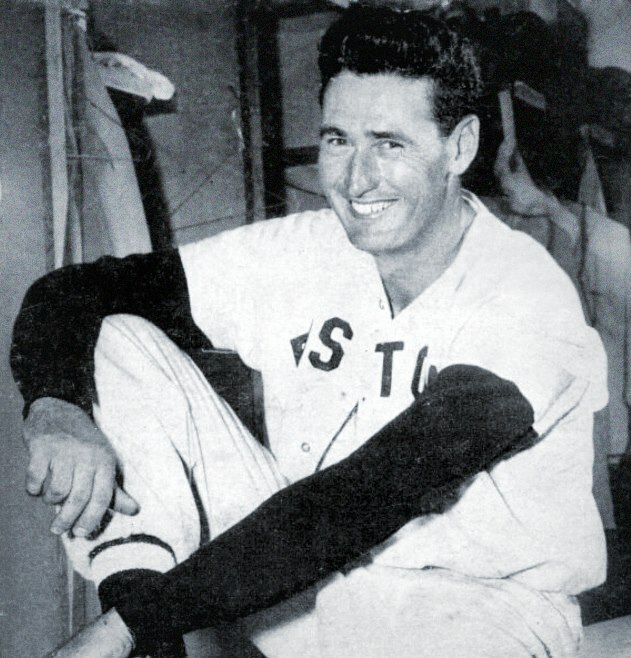 Williams debuted with the Red Sox in 1939. Too bad, they didn’t start handing out the Rookie of the Year award until 1947. Because Williams would have won that honor in ’39, no contest. The lefty batter slammed 31 home runs, drove in 145 (first in the American League) and hit.327 with an OPS of 1.045 (OPS+ 160). He finished fourth in the MVP race. Two years later, in that legendary year of 1941,Ted Williams hit .406. Another pretty good player, the New York Yankees’ Joe DiMaggio, batted safety in 56 straight games and took home the MVP award. Who should have won? DiMaggio put up a WAR of 9.1, Williams put up a 10.9. The Yanks and Joe D, though, won the A.L. pennant, finishing 17 games ahead of the Red Sox and Teddy Ballgame. (Interesting note: DiMaggio batted .408 during the streak, but Williams hit .412. Williams also had a higher OPS during that span, 1.224 to 1.180). Following another big year in 1942 (Triple Crown winner, runner-up to the Yankees’ Joe Gordon for MVP), Williams left baseball for the next three seasons. Lt. Ted Williams, U.S. Marine Corps aviator, trained pilots for combat during World War II. Back with Boston in 1946, Williams finally won the MVP. He was runner-up in ’47 (another Triple Crown year), third in ’48 and first again in 1949. During the first inning of the 1950 All-Star Game, Williams banged up his elbow, crashing into the Comiskey Park wall while making a catch. The Red Sox great said he never again felt “swishy” at the plate. Boston’s clean-up hitter left for Korea in 1952. At his final game before heading out, the Red Sox held Ted Williams Day at Fenway Park. The team gave him a Cadillac and a memory book signed by 400,000 adoring fans. Williams stepped to a microphone and told the crowd: “This is the greatest day in my life,” and he thought that he might never play again. It was close. Marine Corps Capt. Ted Williams flew 39 combat missions and crash landed once in his Panther Jet. Enemy flak hit his aircraft Feb. 16, 1953, 15 miles from the North Korean capital of Pyongyang. What could he do? He could ditch into the Yellow Sea, but it was nearly frozen and full of ice chunks. He could eject, but he was 6-feet-3 and thought he might tear off his legs. His plane on fire, smoke blowing out from the back, Williams hit the runway at his landing strip; he slid for 9,000 feet. Williams thought the plane might explode. It did not; it ran out of fuel. Williams left his playing days with a sublime set of numbers. He smashed 521 home runs, drove in 1,839 runs and batted .344. His batting average is the highest of any player who spent his entire career in the live-ball era (post-1920). He posted a .482 on-base percentage, the best ever, and a .634 slugging percentage, the second-best ever (Ruth: 690). Boston’s No. 9 put up a career OPS of 1.1155, No. 2 all-time (Ruth: 1.1636). He retired with an OPS+ of 190, also No. 2 all-time (Ruth: 206). Williams played on 19 All-Star teams and finished in the Top 5 in the MVP vote nine times. Who was the greatest hitter who ever lived? If it wasn’t the Babe, it was Teddy Ballgame of San Diego, Calif., and the Boston Red Sox. Ted Williams wasn’t above taking a free pass. As a ballplayer, Ozzie Guillen was sort of an anti-Ted Williams. Ozzie could field OK, but he didn’t hit for power (28 home runs in 16 seasons), and he didn’t hit for average (.264 lifetime.) He didn’t hit, period. He didn’t even make up for his low batting average by taking some walks. Guillen only drew 239 free passes in a career that covered 7,133 plate appearances. In 1996, Guillen came to the plate 528 times for the Chicago White Sox and walked just 10 times. He retired with a paltry .287 on-base percentage. Now, Williams could hit, of course. He did it better than just about anyone not named Babe Ruth. He batted .344 in a 19-year career with the Boston Red Sox. Plus, he blasted 521 homers and drove in 1,839 runs. Teddy Ballgame knew the strike zone, too. He took 2,021 walks and finished with a .482 on-base percentage, better than anyone. Which brings us to this day in 1955. Williams ended up with a .356 batting average, well ahead of the Tigers’ Al Kaline at .340. The Splendid Splinter walked 136 times, though, and fell short of qualifying for the batting title. Something similar happened in 1954. Rules to qualify for the batting title have changed through the years. From 1950-56, a batter needed to average 2.6 at-bats per team game. With the 154-game schedule in effect, that meant at least 400 at-bats. With Williams in mind, the rule changed in 1957. A player would now need to average at least 3.1 plate appearance per team game. No longer would good hitters be penalized for taking walks. The rule change helped guys like Williams. Guillen wasn’t really affected.